Homeowner Associations must continually maintain and renovate entryways, common areas, and park facilities to repair weathered and worn surfaces and remove signs of vandalism. Concrete and pavers are faded and stained, while park tables, benches and equipment are in constant need of repair. Commercial sealers, epoxies and stains break down within 6-12 months requiring costly reapplication. The high cost of maintenance reduces the amount of funds that are available for improvement and upgrades to the community. 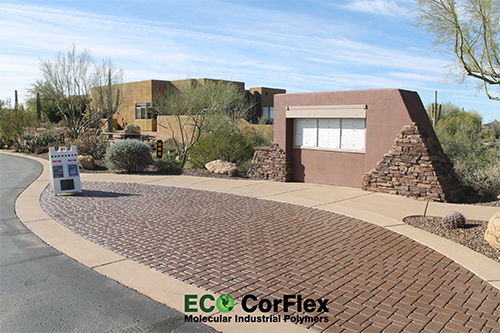 To enhance property value and community appeal, Eco-CorFlex Poly Enhance can be applied to concrete, pavers, and stone to restore and add color to accent entryways, walkways and community areas. For residential use, Poly Enhance is used to seal and transform stained and dirty driveways to create curbside appeal and increase home values. Eco-CorFlex Poly Enhance was created to protect and beautify a myriad of surfaces for interior and exterior applications. Poly Enhance can be applied to virtually any surface or material such as concrete, paver stones and exposed aggregate. In addition to bonding to the surface, Eco-CorFlex Poly Enhance densifies and strengthens the material it is applied to. The product has extreme durability, chemical and UV resistance. Poly Enhance creates an impervious barrier that will not allow oil or other substances and penetrate and stain the surface. Cleanup is fast and easy using a hose and squeegee. In addition to beautification, Eco-CorFlex Poly Enhance protects against vandalism by creating a barrier that does not allows graffiti, gum and other substances to penetrate or adhere to the substrate. 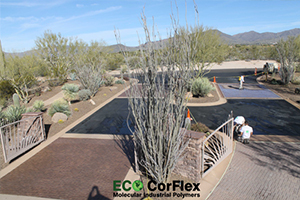 What is Eco-CorFlex Poly Enhance?